Dr Mari's Faith Stop: Thanksgiving: My New Book is Coming Soon! 12/12 UPDATE: My devotional for healthcare professionals and caregivers is now available! Visit my author website for details! 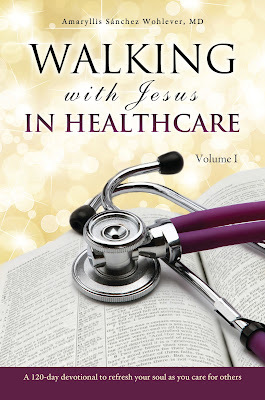 I am thrilled to share that I just finished the final round of edits for my devotional, Walking with Jesus in Healthcare. With God's help, it will be in print very soon! My faith has grown and my heart has been transformed while writing it, and I pray that it will bless every reader with a closer walk with God. Here's an excerpt I share at the end of the book. It comes from a hymn written by Fanny Crosby in 1882. It is also the song of my heart as I complete this work I was called to do. What a privilege! riches like these to secure!" For more information and updates, visit my author website.